As the delays to opening the Waterview Connection drag on, more and more people are beginning to question the project. There are quite a few rumours floating about as to the cause of the delays, some of which we’ve heard from people working on the project. The NZTA deny all of these, instead saying the issue lies with some sprinkler valves and jet fans. I’m happy to accept their word on that unless anyone has evidence to the contrary. They also say these issues are now fixed. Personally, I’m more interested in when the project will open and what impact it will have on transport. Last week the NZTA went on the AM show to discuss the project and it was those two questions. The comments from them on congestion were particularly interesting. I think one of the problems the NZTA have is the expectation of the project by many in the general public, and especially backed up by the government who frequently trumpet that they’re investing in Auckland to get the city moving. The narrative, whether the NZTA have said it or not, has been that Waterview is going to improve congestion. Until recently the NZTA seemed quite happy to let that become embedded so it seems like now they’re starting to hose those expectations down. Most commonly when the NZTA have talked about congestion, it’s been related to the project’s impact on local streets. Given there doesn’t appear to be anything planned to capitalise on any shift in travel, it will be interesting to see how long – if at all – that impact lasts. Below is one of the times they have claimed it will relieve congestion, and not just on local roads. One of the objectives of the WRR is to relieve congestion that currently occurs on SH1 and to provide an alternative route north across the Auckland Isthmus. 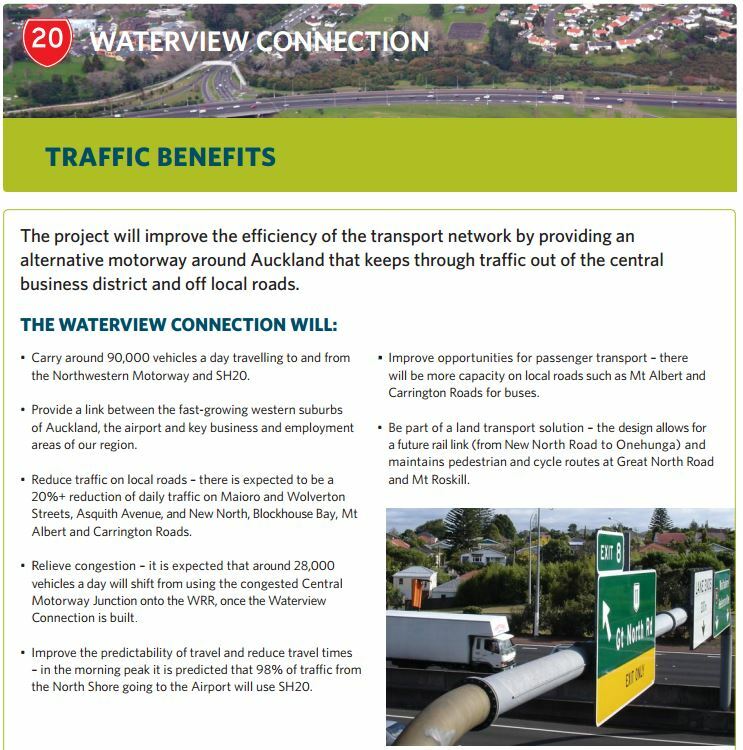 The provision of the Waterview Connection is expected to result in traffic diverting from SH1 and CMJ to the WRR. The construction of the Waterview Connection reduces travel times and congestion across much of the network, which is expected to induce some additional travel onto the road network. SH20 is observed to operate satisfactorily throughout the AM peak period around the Great North Road Interchange and through the tunnel, as indicated by the travel times along the route presented above. That’s a lot of saying everything will be fine, and there’s more where that came from. And finally, when will the project actually open? All NZTA continue to say is that it will be sometime in the next few months – although I’ve heard a suggestion we may even find out today. I think there’s a good chance they’ll hold off till mid-July, timed with school holidays to try and avoid really severe congestion. But when do you think, place your bets in the comments below. I’d suggest July. One thing is for sure – it is absolutely going to paralyse the NW motorway heading west. The traffic current backs up around Avondale, then bunches totally at Rosebank Road and Te Atatu. Now a whole bunch of cars are going to join ahead of Avondale and reduce the lanes available for the current levels of through traffic. It doesn’t take a genius to figure out what’s going to happen, and in the absence of the new network in the West or an actual busway, West Auckland is poked. Agreed, the only reason the Western flows currently is that the three lane bottleneck opens out into 5(?) clear lanes. Once traffic joins from these lanes too its all over rover. My money is on waffly excuses through til after the election. This will get jumped on if it opens and causes horrendous congestion two months out from the election. Lets get the light rail in soon! I disagree. Going west from Waterview will not be much worse, initially. The traffic that will use the NW in that direction is currently entering the NW at Waterview via the current on ramp or have crawled their way through spaghetti junction and are already on the NW. These are commuters who live or work out west and although both groups are growing opening the tunnel is not going to rapidly increase their numbers. I cannot envisage may additional trips being induced out of the tunnel to the NW. The new volume will be from out of the tunnels and in towards the city. This will be the stuff up. NZTA should be planning a staged opening. I’d go South to north west first. Northwest to south second. Add the second north bound offramp to the city. Finally add the south bound on ramp from the city. Give some drivers a chance to get used to the new layout progressively rather than all up, all in. I agree, the east facing ramps are likely to be the ones causing the issues and the obvious solution is to toll them. +1, toll the ramps that cause the congestion in each period and increase the toll until congestion drops to some acceptable level, do this all over the motorway network. Maybe call is congestion charging? 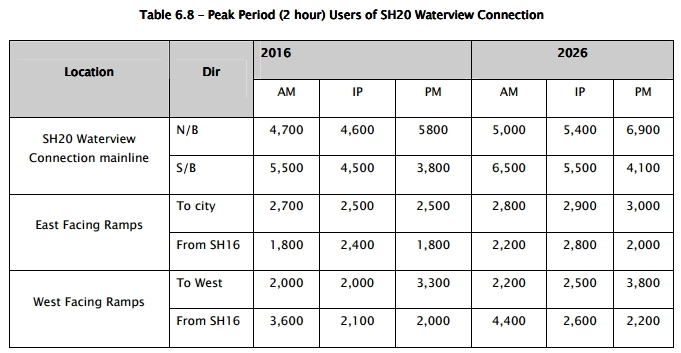 Just to clarify, I mean the west-bound traffic will be worse during the PM peak. While the tunnels won’t increase the total numbers of vehicles, they will significantly condense them and introduce them to a point on the road that is already bottle-necked. It’s like blowing up a dam – congestion in other part of the network is stopping traffic reaching that point any quicker, so it gets drip fed in. The tunnels will spit them out at the already-most congested point.Add in the eternal Tat Penn roadworks, the Lincoln Road Onramp and the Lincoln > Westgate works and it doesn’t take a rocket genius to figure out what the outcome will be. This does not look likely any weekday morning. These merge points are very close, and multilane. This will be a failure point. And the primary failure? Failing to build the relieving Rapid Transit Route on 16 while they were there. So one of strategy, conception, and understanding. Very poor. Has the Northern Busway relieved congestion on the Harbour Bridge? Yes. There are now fewer people driving on the bridge, even though more demand for travel across the bridge has been induced. Yes and no. More people carried in fewer vehicles (according to NZTA data), effectively the busway has absorbed the growth in transit demand that would otherwise have dramatically increased congestion. Congestion on the harbour bridge isn’t an issue. Even at the peak the bridge is usually free flowing, with speeds only a little bit below off-peak. After all it is the widest part of the Auckland motorway network, with five lanes in the peak direction. The complete opposite of a bottleneck. it’s not the widest any more. SH16 westbound, between Pt Chev and Rosebank is 5 lanes + bus shoulder, so 6 lanes at peak. My experience is that traffic flow over the Auckland Harbour Bridge is so good that trialling not moving the barriers would seem a good idea as counter flow traffic appears to be unnecessarily held up on a daily basis. Depends how you frame your baseline. Traffic congestion on the bridge is no worse than it was ten years ago, despite the bridge moving an extra five thousand people an hour at peak times. So no, it hasn’t *reduced* congestion in fact. But compared to what congestion might be like today without the busway we can probably say yes, without the busway congestion would be far worse. But that almost misses the true point. Which is we now have an extra 5,000 people moving across the harbour in the peak direction without being in congestion at all, equivalent to a whole new four lane motorway from Albany to the City for about $300m. Bargain! I can’t give you specifics but I very rarely experience slow downs on the actual harbour bridge on daily commutes. Some of the reply’s here confirm that responders to this blog aren’t the sharpest knives. The reason why the harbour bridge flows is because there are no on ramps or off ramps on the bridge. The amount of traffic on the bridge is restricted by the approach roads. @Harriet that is not what I stated. Though the concept can be applied. When I was last in Chicago the fast lane was blocked off from the rest of the motorway to create free-flowing lanes specifically for those who lived a little further out. Innovative thinking that seems a little beyond those who control Auckland’s destiny. If that extra growth of 5k in people across the bridge were in cars not in buses, you would have congestion increased, regardless of the lack of on/off ramps. The plural of reply is replies and what is the purpose of your apostrophe? It’s not that hard Matthew. No on and off ramps on the bridge? The bridge literally is wider at the southern landing due to the Shelley Beach Rd and Curran St ramps physically overlapping with the bridge structure. I’m guessing they’ll have to finish the lane widening and road works on the South Western first… Still a good few months away. Is that maybe one of the reasons for the delay? Another extravagant waste of money – if only a fraction of the funds blindly allocated to such crazy projects, was ploughed into creating a decent public transport network – there would be no need for more motorways, fly-overs and tunnels that just exacerbate the chaos. Really? I heard the East West link would complete the motorway. Yes after East West I am sure someone will pop up and say the Eastern motorway is needed to complete the motorway. Then the Central motorway will be needed to complete the motorway. Then that mess out at the Ash Street bridge will need to be sorted to complete the motorway. Pakuranga Rd was originally planned as motorway so that will be needed to complete the motorway. Stanley Street is a good project for someone who wants to complete the motorway. Viva L’autoroute! This shows that the RoNS is critically inadequate ideology for cities. By limiting NZTA to trying to provide effective and efficient access in cities with only one tool: the motorway, this faith-based doctrine has prevented them from funding and building what is also needed; a full network of the only peak-time effective system. Rapid Transit. Together these systems are mutually supportive; urban motorways without quality alternatives are simply traffic congestion generators, and economy suppressors. Justification for the obscene amount of money spent was it will improve the way we get around Auckland, in other words completes the motorways system and allows faster free flowing traffic. I predict city bound its going to be like a log jam. It already is, with Great North Rd feeding the motorway as it currently stands. But anyway if the “issues” are sorted, why is it not opened today? Election time? Anticipated traffic chaos? Failed government policy? As mentioned in the video, once the issues are sorted out there is a requirement for testing (ie commissioning) to be completed prior to opening the tunnel. If they don’t do this and an incident results in fatalities due to fire-life safety equipment failing, I don’t believe that everyone would say, “well at least they got it open”. It was Matt L I quoted above who said the issues been fixed. So why, again, is it not open? I can’t wait to use it to drive out to Woodhill forest from Onehunga for an early morning weekend mountain bike ride. Any other time – good luck car commuters, she’s all yours. If David Dix is here drop me an email please, working on a more heavy rail variation to CFN2. CFN2 needs to be done ASAP what ever the nuances of it is now, I have a strong feeling Auckland is growing and will grow faster than 1 new person every 10 minutes. I suspect the rate of population growth will decline again. Either NZers will start heading to Australia again like the have for 40 years or so, or the current levels of immigration will become politically untenable. Its a bit egregious to call out transport planners for faster than expected population growth! The population growth may have been quicker, but even under mid range projections this level of congestion would have happened in a few years anyway so the benefits would have been shortlived. This project was planned for a smaller population that still drove more in total than we do, so it’s actually even worse that higher than expected population growth. The question wasn’t on the ball anyway. It’s not population growth that they needed to estimate, it’s vehicle kilometres travelled, which is far less to do with population, and much more to do with roading capacity. Which they’ve been steadily increasing. And are about to increase again when this big boy’s slot car set opens. They could have calculated quite accurately how much bigger the traffic volume would be by measuring how much they’ve been increasing the roading capacity. or rather, by knowing how much they would increase the roading capacity. I’ll be open a day after elections. If Labour/Greens win it will be immediately blamed on the new transport minister by opposition. It might get much worse. AU is not an option any more, not once NZer are treated the same way as any other nation and have to pay for public schools, full rate for unis, get no governmental support in case of natural disasters etc. In fact many might decide to come back, and you can’t curb that (even thought technically that’s still immigration). If you are correct then we will likely tighten up immigration, wither way I doubt current growth rates will continue in the long term. this will push Auckland straight to the #1 of the Tom Tom report. You know it very well could, if this makes the off peak better but the peak worse. TomTom is all about the difference between peak and off peak. My guess is that it’ll be opened at some point before the election, earlier rather than later. My question is who’ll be the Senior Cabinet Minister that presides, as they will forever be the face of the project. The person selected will also speak volumes about how the Executive think about the project, too junior and they don’t believe in it. I doubt it’ll be the Prime Minister. The other question is what announcements will be made during the opening, will it be more RoNS or will it be a change in tack to reinforce the success of Transit projects in the city? Who pays for the delays with these alliance arrangements? obv taxpayers ultimately but in the short term…? The costs are shared between – its an alliance model. I don’t know the exact key, but any extra costs also in part reduce the profit of the companies involved. Unless the companies can show their client (the govt) that they were not responsible for the delays, I guess. They are making the same claims with the EWL regarding congestion. The conspiracy side of me wonders if on one measure they are delaying the opening of the WC, so that the impact of the extra traffic on SH20 is not shown until they get the EWL approval over the line. While it maybe nice for SH1 to have reduce traffic, that traffic isn’t going to disappear. It will be clogging SH20. Plus within another year and another 20-40k more cars SH1 will be just as busy. The need to take the 1.6-2+ billion for the EWL and convert it into rapid transit instead. EWL hearings are in June / July, so I don’t think so. This article sums up perhaps 35% of why the water view tunnel can’t open yet. It’s great to see the sections of extra southbound lanes now open in preparation for the opening of the Waterview Connection to ensure there’s enough capacity for the additional traffic joining State Highway 1 from State Highway 20,” said Bridges. The traffic engineers have done the modelling which is why Southern Motorway and NW Motorway are being raced to get finished otherwise it will be utter chaos. Is the herald on the payroll for the East-Waste of money project as well? There is no clear objective for travel time reductions – without a single clear goal, every dollar of investment is simply guesswork and wishful thinkings. EVERY single traffic project from now on needs to start with clear objectives about travel time reductions, whether rail, bus, or road. Indeed this would eb a great project to do an honest post completion review, and test what % of claimed “benefits” actually occurred? I expect it will have a true BCR less than one. If you take into account the costs in construction delays, land and operations, the BCR might well be negative. You’re in luck. That’s required for any NZTA funding now. They obviously don’t need to be travel time though. The delay on mechanical and electrical systems highlights one of the reasons tunnels are so expensive that is often forgotten. All the pumps for fire safety and ventilation for a multi-km tunnel are huge and costly, about 1/4 to 1/3 of the entire tunnel cost. They also consume enormous amounts of power to run. The first big Sydney road tunnel (M5 East) consumed more power than all the traffic lights on the south side of that City. So this project will eat into NZTA’s operations and maintenance budget from now on. But yes, the real issue is the fact that this road is unable to deliver traffic congestion relief. Not only has Auckland grown since it was first planned, but most of the job growth has been in the CBD, where Waterview will make no difference. And why all this talk of “missing links” Why do we need to have freeways connecting to everywhere? Surely we should only consider building such costly links where there is demand for them? How much of the traffic on SH1 and SH20 is actually wanting to bypass the CBD? Do we know? Anyone who still believes that ring roads solve traffic congestion should be forced to take a drive on the London M26, or Paris Peripherique, or even the Melbourne Western Ring Road. It ain’t fun. Yes. The strategic planning that governs this outcome is based on a profound misunderstanding of the contemporary urban economy. It is determinedly provincialist and suburban in conception. It quite literally misses the point of a city. This question is, is this critical conceptual mistake only at ministerial level, or does it pervade all the way though the ministry and the agency too? Incidentally, one of the indirect benefits of electric vehicles is that they will reduce costs of ventilation in tunnels. A monumental failure of Waterview could be just what we need to jolt the ‘Moar Roads’ establishment out of its comfy silo and stop it from doing more damage to the country. The indications are that Wellington is heading for a similar disaster with Transmisson Gully and the rest of the Wellington RoNS which look set to unleash carmageddon on the city when they are complete. While I don’t wish misfortune on Auckland, it seems as though nothing short of a lightning bolt will halt this terrible scheme for Wellington, so a total discrediting of the NZTA and a thorough carpeting of Ministers Joyce, Brownlee and Bridges who pushed these ill-conceived schemes might be in all of our long-term interest. Including Auckland’s! ++1! 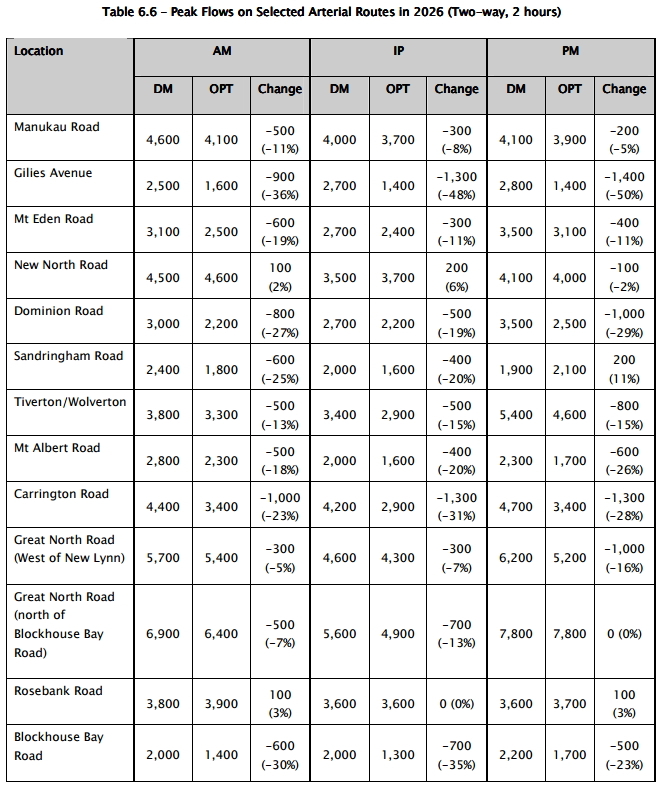 The Wellington Regional Land Transport Plan flyers in 2014/15 even stated that congestion in Wellington hadn’t increased since 2006. Then came the Dowse2Petone and HOT lanes at Mana, and now a we have a ‘smart’ motorway and an expressway. I wonder if the increased commuting times are a surprise? I doubt the ministers really care though; their construction company mates have done well. So if Waterview completes the western ring route then does this mean that norhtbound heavy truck traffic will be diverted away from the harbour bridge to the upper harbour bridge? Then will the harbour bridge west clipon be reworked or replaced to include that light rail line that was reported as feasible in 2009. Despite these fatigue problems, an interesting facet of the bridge was highlighted in a design study done on the clip-ons by Ministry of Works & Development on behalf of the Auckland Regional Authority. This study determined that there is capacity on each of the clip-on bridges to carry a light rail line as well as two lanes of light traffic. Heavy lorry and bus traffic would then use the main centre bridge. David a study by the Ministry of Works is not going to be recent, nor is there any indication of what scale of Light Rail vehicle the think can fit on the clip-ons along with 2 lanes of traffic? In short this source is not up to date nor credible, and contradicts NZTA’s more recent statements. Is there any major urban road project anywhere in the world (excepting busways) that actually reduced peak-time congestion, except in some cases for a brief honeymoon period? I can’t think of any. That is absolutely NOT what urban motorway projects do. The nature of peak traffic is that the new capacity is rapidly filled up. Hopefully, lots of Aucklanders are going to soon get first hand experience of that fact. Quite right, Ian, and proven time and again. Which is why the Victorian Transport Institute, for example, demands that cost benefit analyses must include calculations for induced traffic. People who want to believe in roads, however, will see the initial easing of congestion, and feel all is well. The subsequent induced traffic, which might peak at 2 years or 10 years, will – in their eyes – be due to “population growth”. The northwestern out of the city in the morning and afternoon has been against the flow of traffic and free-flowing. I expect they’ll have succeeded in making this side of this motorway as congested as everywhere else. Ha! Equality in congestion accessibility, yeah? I was wondering: maybe we never created roads in the first place. Maybe roads created humans as the best way for them to procreate. At least we can hold up this up as evidence that NZTA’s reasoning, planning and rationale for the RoNS is anything but sound. The East/West link has the potential to be an even bigger waste of time and money. Let’s not let that proceed as currently proposed! IP, DM, OPT what do these things mean? The positive and negative effects on PT will be interesting to see once they open the WRR. And I am sure that there will be plenty of blog posts and tweets sent by many many people who are all stuck on those buses, coming or going from/to that part of Auckland. Buses that cannot move due to all the rat running by SOV drivers trying to avoid the gridlock on the SH20 and SH16 routes. The gridlock that this thing was supposed to avoid/mitigate. And if traffic gets really really bad, [like the next time there is a major snafu on SH1 anywhere south of SH18 interchange to the SH20 interchange] then the whole of the Auckland motorway system may simply infarct big time with traffic all trying to “take the short cut” out west they were promised would complete the motorway system. And Yeah, Yeah I know, those sorts of things never happen in Auckland, just like it never rains very much or often. And the sun doesn’t ever set on the motorway building programs. Are you suggesting there should be signs above the tunnel portals? Well, the road to hell the North, South or West via Waterview is generally said to be paved with good intentions concrete covered with motorway grade asphalt. So yes, perhaps its true such a sign is more warranted than the current signs that read “One vehicle per lane per Green light” as exists on all Waterview “on” ramps now. And after all the proof or otherwise of Waterviews success is still pending, and will be many many months even once its opened [and long after the election] before the truth is really known. But NZTAs past blunders [SH20/1 intersection for one] with the endless motorway building and roads only focus, coupled with the continuing ever-widening of the existing ones leads me to believe that NZTAs “Leopard”, has certainly not changed its spots yet. Surely part of the reason behind the delayed opening is that they are still working to finish the additional lanes on SH20 south of the tunnels. I expect that once these are complete Waterview will open soon after. Why wouldn’t they just say that, then? Instead they are saying next to nothing, allowing rumour about dodgy concrete and political interference to flourish. I’m picking it will be opened by Steven Joyce himself at the launch of the National Party election campaign. This might of course be timed to occur in the July school holidays as the op has suggested.